Barito is Here to Cater Your Spring Parties! Written by Barito Tacos & Cocktails on March 25, 2019 . Posted in Blog, Catering. The weather is finally warming up, which means it’s time for spring parties. Whether you’re hosting an office party, birthday party, or graduation party, Barito is here to cater your spring parties. Learn more about Barito’s 201 Main Street in Port Jefferson by reading on. Host your spring party at Barito. We host two-hour parties and provide a versatile menu, which is sure to please your guests. Our standard package allows you to pick the protein, which comes with toppings and shells. Select from Barito chicken, barbacoa, chorizo and potato, seasonal vegetables, duck, pork belly, porchetta al pastor, chipotle shrimp, and seasonal fish. 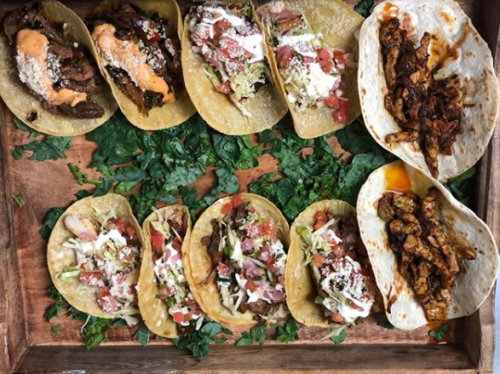 Whichever protein you pick, your selection will come with rice and beans, crema Mexicana, shredded lettuce, sliced jalapeno, cilantro, pico de gallo, limes, cotija cheese, radish, salsa roja, salsa verde, mango habanero, house-made corn tortillas, and house-made crunch taco shells. This allows your guests to customize their meal the way they want. If you want to a combine a drinking package with your food order, we offer a package with mimosa and bellinis, a package with margaritas, sangria, tap beer and wine, an open bar package, and a top-shelf liquor package. Finally, consider some add ons. If you want some appetizers or alternative menu options for your guests, our add-ons include guacamole and chips, salsa and chips, nachos, wings, street corn fritters, mini cheese quesadillas, tostadas, fried rice, papusas, and so on. To schedule your spring party at Barito, all you have to do is visit our website or give us a call. Fill out the form on our page to reserve your date, or talk to a member of our staff by calling 631-828-8808. Barito Tacos & Cocktails is located at 201 Main Street in Port Jefferson, and we hope to cater your party this upcoming spring!